Drum Corps International names one outstanding drum major each from Division II and Division III. The Outstanding Drum Major awards are chosen on the basis of performance on the podium and a personal interview with the drum majors to determine their leadership and character. The awards recipients are chosen by DCI Contest Coordinator Dave Eddleman. Traci Finch accepts the Outstanding Drum Major award from Contest Coordinator Dave Eddleman. Traci Finch of Revolution is the 2006 DCI Outstanding Drum Major for Division III. "Getting to stand in the front and represent the group of kids you work with all summer – to be able to work with them and coach them and watch them grow, but also be one of them, it's great," she said. "I love the passion that everyone has, the drive and determination to be the best. You give it your all every day and the crowd loves you for it. This is a great corps, a big family." 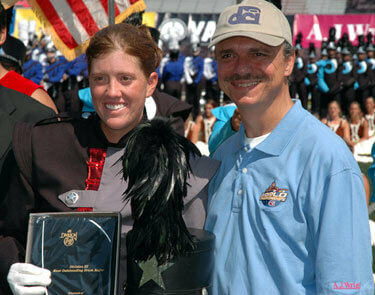 Chris Goodson of Memphis Sound is the 2006 DCI Outstanding Drum Major for Division II. "It's an awesome honor to be selected for this award out of a field of wonderful colleagues, wonderful drum majors that do a wonderful job with their corps, a tough job day in and day out for a very long time," he said. "Obviously, leading the corps in all of its many performances is just great fun and really enjoyable. But the greatest is watching them progress from November to August, and grow as musicians and performers and become better people. While I enjoy the conducting, what keeps me coming back to drum corps and Memphis Sound especially, is the humanitarian aspect. Whether you're Division III, Division II, or Division I, everyone is doing the same job on and off the field and performing for the same crowd. There's this great commonality between the performers and this great family within the activity."